The Retractable Lead Terrain from KONG is a 5 metre long retractable lead with a soft grip handle and a handy brake system. This lovely dog lead is available in various sizes and colours. The KONG Retractable Lead Terrain is a 5 metre long, strong retractable lead made of durable and strong materials. The retractable lead has a soft grip handle, making it comfortable to hold. What's more, you can slow your dog down or bring it back without any problems thanks to the practical and intuitive brake system. This makes it easy to keep your dog under control on walks. The KONG Retractable Lead Terrain is easy to attach to your dog's collar or harness. 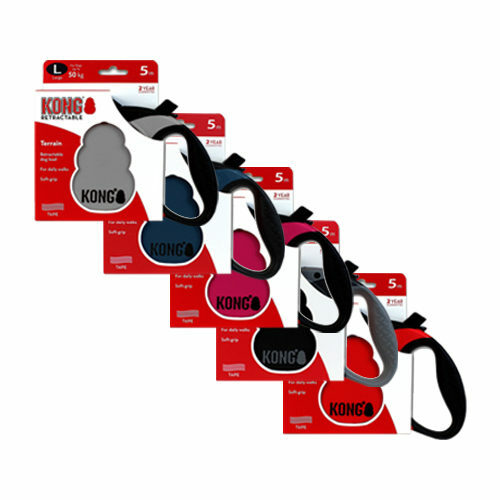 The KONG Retractable Lead Terrain is available in 5 different colours: black, red, blue, grey and pink. Have you used KONG Retractable Lead Terrain before? Let us know what you think about this product. Happy with the Kong lead, feels good quality, only issue I have is it’s not very smooth when it’s being extended, it’s quite sticky but it does retract without any problems. We have been using this lead for several weeks now, with no issues. I purchased this product after previously using the flexi comfort 3, for a number of years and that particular make is no longer available. This I found is as easy to use and is robust at holding our old tyme bulldog +50kg.